First of all, thank you for your support of this grassroots, free community event that has unbelievably been around for almost a decade. The original idea was a simple one, and it remains a relatively simple event… no board of directors, no planning committee, and obviously limited organization. Just a bunch of interesting people coming together to meet other interesting people and sharing their stories, talents, skills, and passions. Outdoors. In a park. You can see the list of your fellow participants on our brand new website at HawaiiGeek.com. My personal joy is bringing different groups together to meet each other and explore what magic can be made together. But sharing the great things we do with the public is also important. Each of us is an advocate of a distinct and wonderful community… and I need your help reaching the larger crowd of people who support you and your work and inviting them to join us! Most of you already have, and I sincerely appreciate it. People are making plans right now for the almost-a-long-weekend, so catching their attention now would be great! I have meanwhile scheduled TV news features next week Monday (HNN) and Wednesday (KITV) and working on more! I’m specifically featuring participating groups (not me, thank gosh! ), so if you are an early morning person and have something visual and dynamic to show off, let me know and I can pitch it! Next Sunday, July 2, we’re returning to Magic Island, where it all began, taking advantage of the more central location, better parking, transit options, beach proximity, restroom proximity… in short, very good news! We’ll be at Picnic Area #39, which is just Ewa/west of where we’ve most frequently set up. Those of you who’ve participated before know that things come together very organically on the day of the event. But there are always some things to keep in mind! The event starts at 9 a.m. and ends at 3 p.m., but not everyone is available all day, and that’s fine. Others hang out until sunset! To avoid searching for parking, and to have cooler weather, many groups arrive very early to set up, and I encourage that. I’m usually there before 7 a.m. The picnic site is in the middle of the park, so handtrucks with big wheels are really helpful. During setup, many of us help each other carry stuff and set up tents and tables. There isn’t a site map or any “assigned” spots. Some groups bring several tents, others just throw down a beach chair or blanket. Ideally, however, the layout should encourage people to mix and mingle — imagine a big campfire, rather than a great wall. See the attached for my naive vision… and come early if you prefer a spot under a tree! Sun protection and hydration is important. Sunscreen and bottled water are recommended. I try to bring extra bottled water, but it always runs out before the sun goes down. No sales allowed. You can exhibit your stuff, share promotional material, and of course encourage people to check out your website or shop, but please leave the cash box at home. No drone flying. I gather this is a new restriction for this park, as past Geek Meets have filled the air with ’em. Let’s just say that if your drones do take off, let’s pretend we don’t know each other! 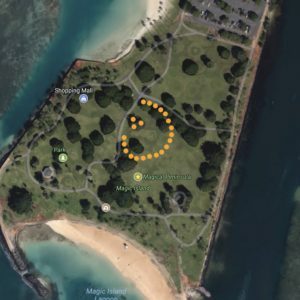 The Hawaii Geek Meet is traditionally a potluck picnic, with each group making its own arrangements and some people contributing items to a communal food table. But if that’s a challenge for you, there’s a new option. For the first time, I talked my employer, Hawaii Information Service, to participate! And we’ve started taking orders for yummy bento lunches for us and a couple of other groups we’re bringing down… donating the proceeds to the Make-a-Wish Hawaii foundation. (Lunch fundraisers are kind of a thing of ours.) Since yummy food is coming to the park anyway, we’re opening up our lunch pre-orders to anyone. We’re supporting Make-a-Wish Hawaii because the Pacific 501st is hoping to stage a “Blast a Trooper” activity to raise more funds. The foundation may even be at the Geek Meet to accept donations directly. This email was probably more information than you wanted or needed, but I was on a roll. If I’ve managed to completely miss answering a question you have, please don’t hesitate to let me know! Thank you very much for being a part of the 10th Hawaii Geek Meet.